A parachute is a device used to slow the motion of an object through an atmosphere by creating drag. Parachutes are made out of cloth, most commonly nylon. Parachutes are often used, to slow the descent of an object falling through an atmosphere. Drogue parachutes are also used to aid horizontal deceleration of a vehicle (a fixed-wing aircraft, or a drag racer), or to provide stability (tandem free-fall, or space shuttle after touchdown). The word "parachute" comes from a French word with a Ancient Greek prefix: "para", meaning "against" or "counter" in Ancient Greek, and "chute", the French word for "fall". Many modern parachutes are classified as semi-rigid wings, which are quite maneuverable, and can facilitate a controlled descent. A parachute is made from thin, lightweight fabric, support tapes and suspension lines. The lines are usually gathered through cloth loops or metal connector links at the ends of several strong straps called risers. The risers in turn are attached to the harness containing the load. As the thin material inflates it increases drag and in turn slowing down the object it is carrying. The parachute successfully slows down the object enough so that it does not break on impact with the ground. Faust Vrančić's design for one of the first parachutes in 1595. According to historian Robert Temple, Chinese texts described a form of parachute 21 centuries ago. In 9th century Al-Andalus, Abbas Ibn Firnas (Armen Firnas) developed a parachute, and Ali Ben Isa also created one of the earliest versions of a parachutewhich John H. Lienhard described in The Engines of Our Ingenuity as "a huge winglike cloak to break his fall" when he "decided to fly off a tower in Cordova". A conical parachute appears for the first time in the 1470s in an Italian manuscript, slightly preceding Leonardo da Vinci's conical parachute designs. It was intended as an escape device to allow people to jump from burning buildings, but there is no evidence that it was actually ever used. Leonardo da Vinci sketched a parachute while he was living in Milan around 1480-1483: a pyramid-shaped canopy held open by a square wooden frame. The first implemented parachute was created in 1595 by the Croatian inventor Faust Vrančić, who named it Homo Volans (Flying Man). 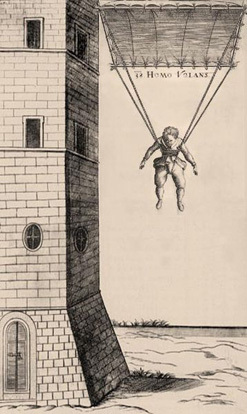 Twenty years later, he implemented his design and tested the parachute by jumping from a tower in Venice in 1617. The event was documented some 30 years after it happened in a book written by John Wilkins, the secretary of the Royal Society in London. 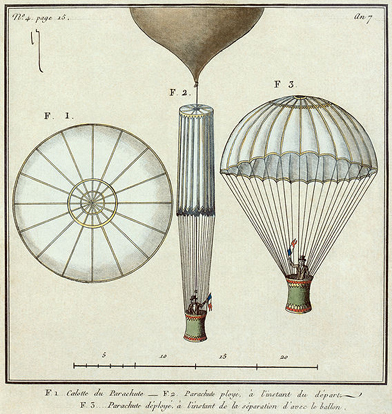 Schematic depiction of Garnerin's parachute, from an early nineteenth century illustration. The modern parachute was invented in the late 18th century by Louis-Sébastien Lenormand in France, who made the first recorded public jump in 1783. Lenormand also sketched it beforehand. Two years later, Jean-Pierre Blanchard demonstrated it as a means of safely disembarking from a hot air balloon. While Blanchard's first parachute demonstrations were conducted with a dog as the passenger, he later had the opportunity to try it himself in 1793 when his hot air balloon ruptured and he used a parachute to escape. Subsequent development of the parachute focused on it becoming more compact. While the early parachutes were made of linen stretched over a wooden frame, in the late 1790s, Blanchard began making parachutes from folded silk, taking advantage of silk's strength and light weight. 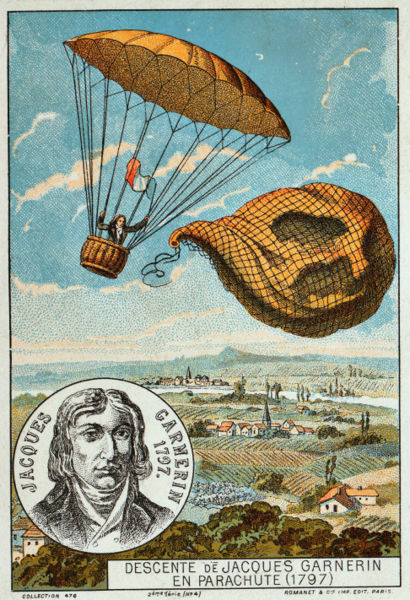 In 1797, André Garnerin made the first jump using such a parachute. Garnerin also invented the vented parachute, which improved the stability of the fall. In 1911, Gleb Kotelnikov invented the first knapsack parachute, later popularized by Paul Letteman and Käthe Paulus. At San Francisco in 1885, Thomas Scott Baldwin was the first person in the United States to descend from a balloon in a parachute. In 1911 Grant Morton made the first parachute jump from an airplane, in a Wright Model B, at Venice Beach, California. The pilot of the plane was Phil Parmalee. Morton's parachute was of the 'throw-out' type whereas he held the chute in his arms as he left the aircraft. On 1 March 1912, US Army Captain Albert Berry made the first parachute jump from a moving aircraft over Missouri using a 'pack' style chute. This is the style of chute that became en reg with the actual chute being stored or housed in a casing on the jumper's body. Štefan Banič from Slovakia invented the first actively used parachute, patenting it in 1913. On 21 June 1913 Georgia Broadwick became the first woman to parachute jump from a moving aircraft, doing so over Los Angeles. The first military use for the parachute was for use by artillery spotters on tethered observation balloons in World War I. These were tempting targets for enemy fighter aircraft, though difficult to destroy, due to their heavy antiaircraft defenses. Because they were difficult to escape from, and dangerous when on fire due to their hydrogen inflation, observers would abandon them and descend by parachute as soon as enemy aircraft were seen. The ground crew would then attempt to retrieve and deflate the balloon as quickly as possible. No parachutes were issued to Allied "heavier-than-air" aircrew.As a result, a pilot only had three options, to ride his machine into the ground, jump from several thousand feet, or commit suicide using a standard-issued revolver. In the UK, Everard Calthrop, a railway engineer, and breeder of Arab horses, invented and marketed through his Aerial Patents Company a "British Parachute". Thomas Orde-Lees, known as the Mad Major, demonstrated that parachutes could be used successfully from a low height (he jumped from Tower Bridge in London) which led to their being used by the Royal Flying Corps. The German air service, in 1918, became the world's first to introduce a standard parachute and the only one at the time. Despite Germany issuing their pilots with parachutes, their efficiency was relatively poor. As a result, many pilots died whilst using them, including aces such as Oberleutnant Erich Lowenhardt (who fell from 12,000 feet (3,700 m) after being accidentally rammed by another German aircraft) and Fritz Rumey who tested it in 1918, only to have it fail at a little over 3,000 ft.
Tethered parachutes were initially tried but caused problems when the aircraft was spinning. In 1919 Leslie Irvin invented and successfully tested a parachute that the pilot could deploy when clear of the aircraft. He became the first person to make a premeditated free-fall parachute jump from an airplane. An early brochure of the Irvin Air Chute Company credits William O'Connor 24 August 1920 at McCook Field near Dayton, Ohio as the first person to be saved by an Irvin parachute. Another life-saving jump was made at McCook Field by test pilot Lt. Harold H. Harris on 20 October 1922. Shortly after Harris' jump two Dayton newspaper reporters suggested the creation of the Caterpillar Club for successful parachute jumps from disabled aircraft. Beginning with Italy in 1927, several countries experimented with using parachutes to drop soldiers behind enemy lines, and by World War II large airborne forces were trained and used in surprise attacks, as in the 1941 Battle of Crete. 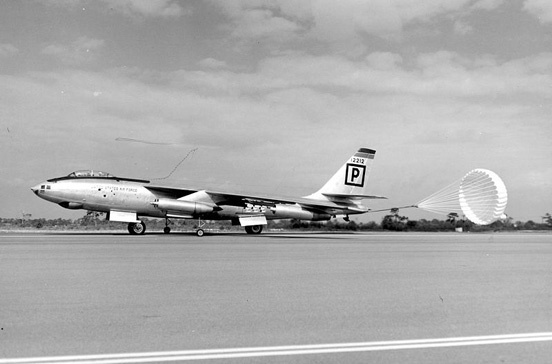 Aircraft crew were routinely equipped with parachutes for emergencies as well. Round parachutes are purely drag devices (that is, unlike the ram-air types, they provide no lift) and are used in military, emergency and cargo applications. These have large dome-shaped canopies made from a single layer of triangular cloth gores. Some skydivers call them "jellyfish 'chutes" because of the resemblance. Modern sports parachutists rarely use this type. The first round parachutes were simple, flat circulars. These early parachutes suffered from instability caused by oscillations. A hole in the apex helped to vent some air and reduce the oscillations. Many military applications adopted conical (i.e. cone-shaped) or parabolic (a flat circular canopy with an extended skirt) shapes, such as the US Army T-10 static-line parachute. A round parachute with no holes in it is more prone to oscillate, and is not considered to be steerable. A small (3-8 mph) forward speed and steering can be achieved by modifying the canopy to allow air to escape from the back of the canopy, providing limited forward speed. Modifications can be cuts in various sections (gores) across the back, or by cutting 4 lines in the back to have some of the skirt bow out. Turning is accomplished by deforming the edges of the modifications, giving the parachute more speed from one side of the modification than the other. This gives the jumpers the ability to steer the parachute, enabling them to avoid obstacles and to turn into the wind to minimize horizontal speed at landing. The unique design characteristics of cruciform parachutes reduces oscillations (its user swinging back and forth) and violent turns during descent. This technology will be used by the US Army as it replaces its current T-10 parachutes under a program called ATPS (Advanced Tactical Parachute System). The ATPS canopy is a highly modified version of a cross/ cruciform platform and is square in appearance. The ATPS (T-11) system will reduce the rate of descent by 30 percent from 21 feet per second (6.4 m/s) to 15.75 feet per second (4.80 m/s). The T-11 is designed to have an average rate of descent 14% slower than the T-10D thus resulting in lower landing injury rates for jumpers. The decline in rate of descent will reduce the impact energy by almost 25% to lessen the potential for injury. A variation on the round parachute is the pull down apex parachute. Invented by a Frenchman named LeMogne, it is referred to as a Para-Commander canopy in some circles, after the first model of the type. It is a round parachute, but with suspension lines to the canopy apex that applies load there and pulls the apex closer to the load, distorting the round shape into a somewhat flattened or lenticular shape. Sport parachuting has experimented with the Rogallo wing, among other shapes and forms. These were nearly always an attempt to increase the forward speed and reduce the landing speed offered by the other options at the time. 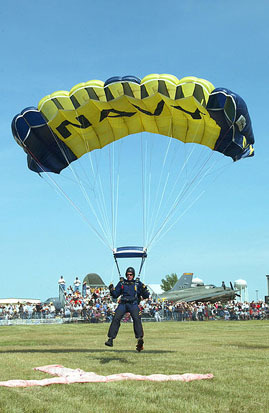 The ram-air parachute's development and the subsequent introduction of the sail slider to slow deployment reduced the level of experimentation in the sport parachuting community. Ribbon and ring parachutes have similarities to annular designs. They are frequently designed to deploy at supersonic speeds. A conventional parachute would instantly burst upon opening at such speeds. Ribbon parachutes have a ring-shaped canopy, often with a large hole in the center to release the pressure. Sometimes the ring is broken into ribbons connected by ropes to leak air even more. These large leaks lower the stress on the parachute so it does not burst or shred when it opens. Ribbon parachutes made of kevlar are used on nuclear bombs such as the B61 and B83. Most modern parachutes are self-inflating "ram-air" airfoils known as a parafoil that provide control of speed and direction similar to paragliders. Paragliders have much greater lift and range, but parachutes are designed to handle, spread and mitigate the stresses of deployment at terminal velocity. All ram-air parafoils have two layers of fabric; top and bottom, connected by airfoil-shaped fabric ribs to form "cells." The cells fill with high pressure air from vents that face forward on the leading edge of the airfoil. The fabric is shaped and the parachute lines trimmed under load such that the ballooning fabric inflates into an airfoil shape. This airfoil is sometimes maintained by use of fabric one-way valves called Airlocks. Only the hand-deployed pilot chute may be collapsed automatically after deployment—by a kill line reducing the in-flight drag of the pilot chute on the main canopy. Reserves, on the other hand, do not retain their pilot chutes after deployment. The reserve deployment bag and pilot chute are not connected to the canopy in a reserve system. This is known as a free-bag configuration, and the components are often lost during a reserve deployment. 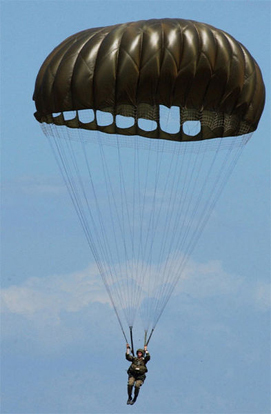 Paratroopers' main parachutes are usually deployed by static lines that release the parachute, yet retain the deployment bag that contains the parachute—without relying on a pilot chute for deployment. In this configuration the deployment bag is known as a direct-bag system, in which the deployment is rapid, consistent, and reliable. This kind of deployment is also used by student skydivers going through a static line progression, a kind of student program. Personal ram-air parachutes are loosely divided into two varieties: rectangular or tapered, commonly referred to as "squares" or "ellipticals" respectively. Medium-performance canopies (reserve-, BASE-, canopy formation-, and accuracy-type) are usually rectangular. High-performance, ram-air parachutes have a slightly tapered shape to their leading and/or trailing edges when viewed in plan form, and are known as ellipticals. Sometimes all the taper is in the leading edge (front), and sometimes in the trailing edge (tail). Ellipticals are usually used only by sports parachutists. Ellipticals often have smaller, more numerous fabric cells and are shallower in profile. Their canopies can be anywhere from slightly elliptical to highly elliptical—indicating the amount of taper in the canopy design, which is often an indicator of the responsiveness of the canopy to control input for a given wing loading, and of the level of experience required to pilot the canopy safely. The rectangular parachute designs tend to look like square, inflatable air mattresses with open front ends. They are generally safer to operate because they are less prone to dive rapidly with relatively small control inputs, they are usually flown with lower wing loadings per square foot of area, and they glide more slowly. They typically have a less-efficient glide ratio. Wing loading of parachutes is measured similarly to that of aircraft: comparing the number of pounds (exit weight) to square footage of parachute fabric. Typical wing loadings for students, accuracy competitors, and BASE jumpers are less than one pound per square foot—often 0.7 pounds per square foot or less. Most student skydivers fly with wing loadings below one pound per square foot. Most sport jumpers fly with wing loadings between 1.0 and 1.4 pounds per square foot, but many interested in performance landings exceed this wing loading. Professional Canopy pilots compete at wing loadings of 2 to 2.6 pounds per square foot. While ram-air parachutes with wing loadings higher than four pounds per square foot have been landed, this is strictly the realm of professional test jumpers. High-speed, cross-braced parachutes such as the Velocity, VX, XAOS and Sensei have given birth to a new branch of sport parachuting called "swooping." A race course is set up in the landing area for expert pilots to measure the distance they are able to fly past the 6-foot (1.8 m) tall entry gate. Current world records exceed 600 feet (180 m). Aspect ratio is another way to measure ram-air parachutes. Aspect ratios of parachutes are measured the same way as aircraft wings, by comparing span with chord. Low aspect ratio parachutes (i.e. span 1.8 times the chord) are now limited to precision landing competitions. Popular precision landing parachutes include Jalbert (now NAA) Para-Foils and John Eiff's series of Challenger Classics. While low aspect ratio parachutes tend to be extremely stable—with gentle stall characteristics—they suffer from steep glide ratios and small "sweet spots" for timing the landing flare. Medium aspect ratio (i.e. 2.1) parachutes are widely used for reserves, BASE, and canopy formation competition because of their predictable opening characteristics. 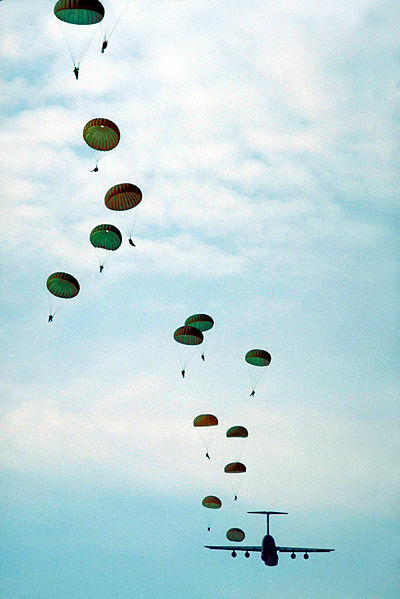 Most medium aspect ratio parachutes have seven cells. High aspect ratio parachutes have the flattest glide and the largest "sweet spots" (for timing the landing flare) but the least predictable openings. An aspect ratio of 2.7 is about the upper limit for parachutes. High aspect ratio canopies typically have nine or more cells. All reserve ram-air parachutes are of the square variety, because of the greater reliability, and the less-demanding handling characteristics. Main parachutes used by skydivers today are designed to open softly. Overly rapid deployment was an early problem with ram-air designs. The primary innovation that slows the deployment of a ram-air canopy is the slider; a small rectangular piece of fabric with a grommet near each corner. Four collections of lines go through the grommets to the risers. During deployment, the slider slides down from the canopy to just above the risers. The slider is slowed by air resistance as it descends and reduces the rate at which the lines can spread. This reduces the speed at which the canopy can open and inflate. The deployment process is inherently chaotic. Rapid deployments can still occur even with well-behaved canopies. On rare occasions deployment can even be so rapid that the jumper suffers bruising, injury, or death. Changes in slider design can impact the speed with which the parachute opens. Sliders can be made larger or have pockets installed to reduce the opening speed (making it softer) by increasing the amount of fabric providing air resistance. They can also be used to increase the opening speed (making it faster), as is desirable for reserve canopies and BASE canopies. Reducing the amount of fabric decreases the air resistance. This can be done by making the slider smaller, inserting a mesh panel, or cutting a hole in the slider. A parachute is carefully folded, or "packed" to ensure that it will open reliably. If a parachute is not packed properly it can result in death because the main parachute might fail to deploy correctly or fully. In the U.S. and many developed countries, emergency and reserve parachutes are packed by "riggers" who must be trained and certified according to legal standards. Sport skydivers are always trained to pack their own primary "main" parachutes. Parachutes can malfunction in several ways. Malfunctions can range from minor problems that can be corrected in-flight and still be landed, to catastrophic malfunctions that require the main parachute to be cut away using a modern 3-ring release system, and the reserve be deployed. Most skydivers also equip themselves with small barometric computers (known as an AAD or automatic activation device like Cypres, FXC or Vigil) that will automatically activate the reserve parachute if the skydiver himself has not deployed a parachute to reduce his rate of descent by a preset altitude. Exact numbers are difficult to estimate, but approximately one in a thousand sports main parachute openings malfunction, and must be cut away, although some skydivers have many hundreds of jumps and never cut away. Reserve parachutes are packed and deployed differently. They are also designed more conservatively, and are built and tested to more exacting standards, making them more reliable than main parachutes. However, the primary safety advantage of a reserve chute comes from the probability of an unlikely main malfunction being multiplied by the even less likely probability of a reserve malfunction. This yields an even smaller probability of a double malfunction, although the possibility of a main malfunction that cannot be cut away causing a reserve malfunction is a very real risk. In the U.S., the average fatality rate is considered to be about 1 in 80,000 jumps. Most injuries and fatalities in sport skydiving occur under a fully functional main parachute because the skydiver made an error in judgment while flying the canopy—resulting in high-speed impact with the ground, impact with a hazard on the ground that might otherwise have been avoided, or collision with another skydiver under canopy. 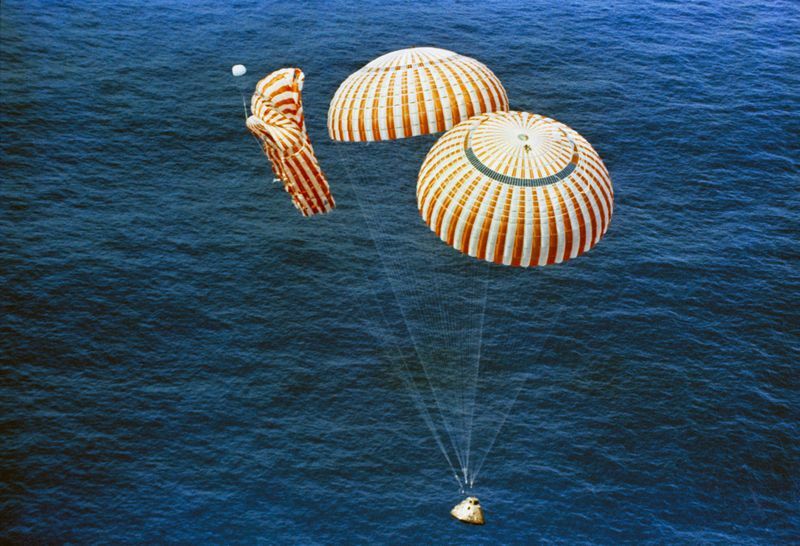 The Apollo 15 capsule landed safely despite a parachute failure. Below are listed malfunctions specific to round-parachutes. For malfunctions specific to square parachutes, see Malfunction (parachuting). A "cigarette roll" occurs when a parachute deploys fully from the bag but fails to open. The parachute then appears as a vertical column of cloth (in the general shape of a cigarette), providing the jumper with very little drag. It is caused when one skirt of the canopy, instead of expanding outward, is blown against the opposite skirt. The column of nylon fabric, buffeted by the wind, rapidly heats from the friction of the nylon rubbing against nylon and can melt the fabric and fuse it together, preventing any hope of the canopy opening. On 16 August 1960 Joseph Kittinger, in the Excelsior III test jump, set the current world record for the highest parachute jump. He jumped from a balloon at altitude of 101,516 feet (30,942 m) (which was also a manned balloon altitude record at the time). A small stabilizer chute deployed successfully and Kittinger fell for 4 minutes and 36 seconds,, also setting a still-standing world record for the longest parachute free-fall, if falling with a stabilizer chute is counted as free-fall. At an altitude of 17,500 feet (5,300 m), Kittinger opened his main chute and landed safely in the New Mexico desert. The whole descent took 13 minutes and 45 seconds. During the descent, Kittinger experienced temperatures as low as −94 °F (−70 °C). In the free-fall stage, he reached a top speed of 614 mph (988 km/h or 274 m/s). According to the Guinness book of records, Eugene Andreev (USSR) holds the official FAI record for the longest free-fall parachute jump (without drogue chute) after falling for 80,380 ft (24,500 m) from an altitude of 83,523 ft (25,457 m) near the city of Saratov, Russia on 1 November 1962. CSPA The Canadian Sport Parachuting Association—The governing body for sport skydiving in Canada. FAI The Federation Aeronautique Internationale—The international governing body for all airborne sports.